Tauroctony of the 'Loggia Scoperta' – Mithraeum. Our Common Sun. White marble relief. Musei Vaticani, Loggia Scoperta, No. 18. In a cave, the representation of Mithras, slaying the bull, which wears a broad belt round its body. The raven is perched on the god's flying cloak; the dog, the serpent and the scorpion on the usual places. Cautes stands befor the bull; Cautopates on the other side, grasping with his left the bull's tail. Both are not crossing-legged. 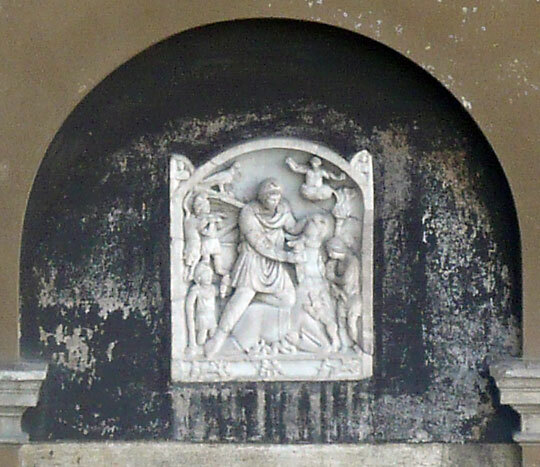 Above the latter Mithras, carrying the bull. Above the bull's head, Mithras' rock-birth (restored as Venus anaduomene). In the small akroteria the busts of Sol (l) and Luna (r). On the lower rim Luna in a chariot, drawn by two oxen; and Sol (r) in a quadriga. Between them a third group is visible, in which Mithras is to be recognised, who is running towards a person, kneeling before him (Sol). Restorations: Mithras' head, r. shoulder, r.h., foremost part of l. arm; the bull's head and neck; nearly the whole Cautes; part of the carried bull; head and arms of Mithras petragenes.